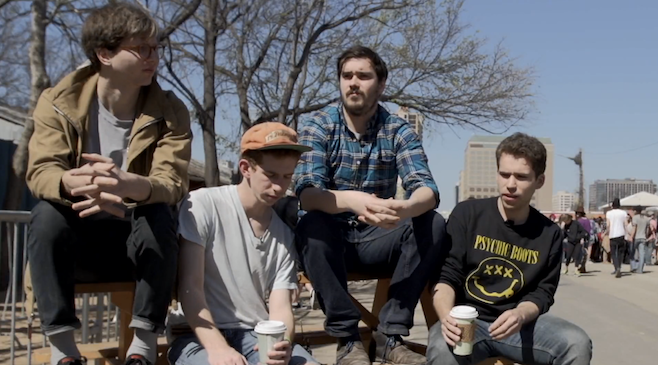 Not so many months ago, Parquet Courts unveiled the excellent Sunbathing Animal. Now the band is back as Parkay Quarts to unveil the even better Content Nausea, out on Tuesday on What's Your Rupture?. The record is marvelous. More direct than the angular Sunbathing Animal, Content Nausea is a perfect distillation of Fall-inspired American post-rock. And there's a cover of Nancy Sinatra's "These Boots are Made for Walking" on the record! Opener "Everyday It Starts" channels the expected Fall love in a direct anthem. Mark E. Smith's influence is enormous on this lead track but here the fellows make that influence into a very American-sounding sort of noise. The title cut is pure Pavement, even more so than a lot of other songs by these guys. "Slide Machine" is more of that Pavement love, only Malkmus and the boys later in their career, while the similarly titled "Pretty Machines" shows signs of a Television influence more than anything else. There's a hint of Beefheart on "The Map" while "Insufferable" marries a very Dischord-style rush of post-punk with a straightforward, nearly angry lyric. After a few near-throwaway, shorter instrumental cuts, there's the magnificent album closer "Uncast Shadow of a Southern Myth" to contend with. Part Silver Jews, part Pavement -- 'natch -- the near-epic stretches out and unwinds with a sort of triumphant sadness. The boys sound like they know that they're playing a fantastic cut and I think it's safe to say that over time this tune will be marked as one of the best songs from Parquet Courts...or Parkay Quarts, or whatever the hell they are calling themselves at that point in the future. Content Nausea from Parkay Quarts (Parquet Courts) is out tomorrow digitally via What's Your Rupture?. It's a great record and, to me at least, a superior take on this band's formula and even better than Sunbathing Animal. The trouble will be getting this digital release the attention it deserves. So get the record and get the word out folks!